Q. Do we have to email the documents to you before we arrive? A. Yes, an application form will be sent to you by email, and you have to return this by email before we can begin planning your wedding. We will then ask you to photocopy and mail, or scan and email, certain required documents so we can apply for your Special Marriage License. Q. Do you need a copy of our Birth Certicates? A. If you are traveling to the Cayman Islands by air, you will be traveling on a passport. We will need a colour photocopy of your passport, and you should bring the original with you when you come in to our office after you have arrived in the Cayman Islands. Only a few people these days use their driver's license and birth-certificate when they are tra veling by cruise ship. Again we need colour copies of these mailed, or scanned in advance and the originals brought in to our office for comparison. We do NOT need both passports and birth certificates. If the name on your passport does not match the name you currently use, you will have to bring a legal document which shows that you name has been changed. Q. What if one of us has been widowed or divorced? A. You will need to mail or scan a certified copy of your spouse's Death certificate, or your Divorce decree with the authorising officer's stamp and signature. Our marriage bureau now required EVERY page of your divorce decree. If you prefer to bring it with you rather than mailing out these personal details, that is fine, just remember that if you forget to bring the entire thing you will not get your Special Marriage License. Q. How many days do I need to be in the Cayman Islands before I can get married? Q. How long will it take to know if a date and time is available? A. Our wedding coordinator will get in touch with you within 48 hours. Because we are a full service company with our own Marriage Officers, we can respond to you very quickly. When you book you need to give us a deposit of US$250 to book your date and time. All but $50 of this is refundable if you cancel your wedding up to one week in advance. Your wedding date can be confirmed 12 months in advance. Please note there is an additional charge for Sunday and Public Holiday weddings when special arrangements have to be made. Weddings during the period 25th December - 2nd January when our office is closed, can only be done by special arrangement with our wedding coordinator). Q. Can we have our wedding in another language? A. All our wedding scripts are in English. You may say your wedding vows in your own language, and you may choose readings or songs in another language if you wish. Since we give you a script of your Wedding Ceremony after the wedding is over, we suggest you give us a copy of these so we can include them in the script. Q. Are the weddings performed in the Cayman Islands legal in all other countries? A. Yes, they are. The United States, Canada and the UK readily accept the Registered Marriage Certificate issued by the Cayman Islands Government once we have filed your marriage. Other countries who are not signatories to the 1961 Hague Convention (abolishing the requirement of legalization for foreign public documents - Article 12) MAY require an "Apostille". If you are in doubt, ask our wedding coordinator whether your country is on the list of countries which do NOT require an Apostille. If you need an Apostille we can facilitate this for you, NB there is an additional fee set by the Cayman Islands Government for this service. There are TWO things which are your responsibility when you choose to be married in the Cayman Islands. b) Check with your local courthouse (once you have received the Registered Marriage Certificate on how to register your marriage certificate in your country or state. Q. What happens if I do not have a witness for the ceremony? A. The Cayman Islands marriage law requires two witnesses over 18 years of age. If you do not have witnesses we can provide them at a cost of $25 US per witness. Simply Weddings All-Inclusive cruise wedding package includes the cost of witnesses. Q. Which days of the week and time of day can I get married? A. You can be married 7 days a week, between the hours of 6am and 8pm. There is an additional charge for weddings on Sundays and Public Holidays. Q. What are some wedding locations I can choose? A. Our most popular wedding locations are our beautiful beaches. Other garden and gazebo locations are available. Church locations are by special arrangement, and there is usually a charge. Most hotels charge to use their beach, so we use free public beaches such as Smith's Cove, and Governor's Beach. See our wedding coordinator for other suggestions, especially for groups over 6 people. Q. Is there a charge for groups? A. There is no charge for your friends and relatives to attend the ceremony. If however, you have a package which includes champagne (for toasting) and cake, there is a service charge for use of the glasses, plates etc. Q. 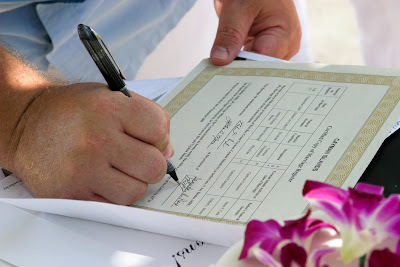 Does the Cayman Islands require a blood test to get the Special Marriage License? Q. Can I bring my own music? A. Some of our packages include, and we can arrange, steelpan, harp and/or violin music for an additional charge. You can bring an Ipod if you wish. Since only a few of the beaches we use have electricity provided, we do not usually provide music. However if you bring a CD we will try to accommodate you. Q. How can I find out what other options are available for my wedding? Q. Can I visit the marriage bureau and get the Special Marriage License on my own? A. Yes, you can. However since the application form must list inter alia the marriage officer, d ate, place and time for the ceremony and since we do NOT CHARGE for making the application on your behalf, there is nothing to be gained by doing this on your own. Q. If I choose to be married at a hotel or resort, can I still get you to do the ceremony? A. Yes. We are an independent family-owned and operated business, but we work with any and all the hotels, and condos in the Cayman Islands. Please note we do not work on commission, and we do not work for any of cruise lines who operate to and from the Cayman Islands. Simply Weddings - Grand Cayman Wedding Celebrants and Planners is a full service wedding company located in George Town, Grand Cayman. We specialise in simple, elegant and personalised weddings for discerning overseas clients. Our clients come from all over the world, but most of them are from the USA, Canada, and the United Kingdom. If you have a question on getting married in the Cayman Islands, call or email Joy or Peggy +1 (345) 9499933 or mywedding@candw.ky without obligation, today.